Should we use technology in worship? John Dyer, Executive Director of Communications and Educational Technology for Dallas Theological Seminary, sought to answer this question at a recent colloquium of doctoral students at Southwestern Baptist Theological Seminary. To answer the question, technology must first be defined. Dyer quipped that although technology is thought to be anything invented after you are born, a more accurate definition is objects of human making. The usefulness of technology has been debated since biblical times. John writes in 2 John 1:12, “Though I have much to write you, I would rather not use paper and ink. Instead I hope to come to you and talk face to face, so that our joy may be complete.” For some things, paper and ink (the technology) were incapable of communicating a message. In addition to communication technologies, even the chair (a technology) has transformed the way we worship. The area we must guard against most is defining our ecclesiology by what technology dictates. In assessing technology, the church must not turn a blind eye to unintended consequences. So, should we use technology in worship? There is no church that does not use some form of technology. The more important question is, what are various technologies doing to worship? 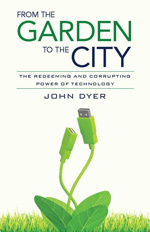 Dyer’s book, From the Garden to the City, will be a helpful source as each congregation wrestles with the question.